The Port of Cape Town lies in the shadow of Table Mountain, approximately 120 nautical miles north west of Cape Agulhas – it is strategically positioned almost at the southern tip of the African continent. The port serves cargoes moving between Europe and the western hemisphere and the Middle East and Australia, especially containers. 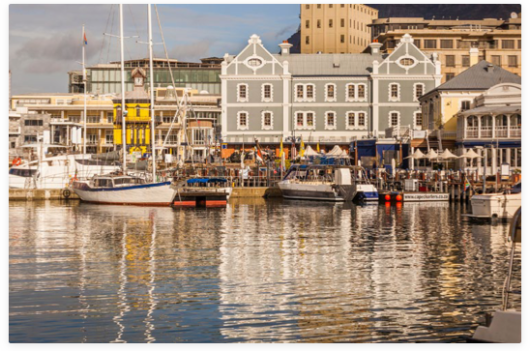 Over the centuries Cape Town has evolved from a staging post on a major east-west trade route into a modern, full-service general cargo port renowned for deciduous fruit and fish exports. Modern facilities required by shipping traffic are all on offer here. Port Control – For emergencies and handling of ships – 24 hours a day, 365 days per year. Cartage – 24 hours per day. Breakbulk – 06:00 – 22:00, Monday to Friday. Containers – 24 hours a day, 362 days per year (not 1 January, 1 May and 25 December). Office hours - (including Revenue) 08:00 to 16:30 Monday to Friday, not public holidays. Tankers are restricted to daylight berthing and unberthing. Under certain circumstances, vessels with a double hull will not be subject to these conditions. Transnet National Ports Authority owns and operates two dry docks, a repair quay and a synchrolift. Robinson Dry Dock - Situated at Victoria Basin, overall docking length 161,2 m, length on bottom = 152,4 m, width at entrance top 20,7 m, maximum width at bottom = 17,2 m, depth over entrance sill HWOST = 7,9 m.
Sturrock Dry Dock - Situated at Duncan Dock, overall docking length 360 m, length on bottom (dock floor) = 350,4 m, width at entrance top = 45,1 m, maximum width at bottom (dock floor) = 38,4 m, depth 14 m, depth over entrance sill HWOST = 13,7 m. A docking length of 369,6 m can be achieved by placing the caisson in the emergency stop at the entrance. The dock can be divided into two compartments of either 132,5 m and 216,1 m or 205,7 m and 142,9 m.
Repair Quay Length 456 m, landing wall 548 m.
SYNCHROLIFT can handle 1 806 tonnes and vessels up to 61 m in length and 15 m in width. Repair lanes available (length) = 2 x 70 m, 1 x 55 m, 2 x 75 m.
Work is undertaken by private companies and services include, ship repair, engineering, refrigeration, hydraulics, cleaning and painting.